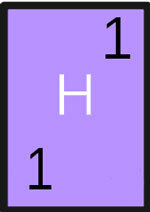 Hydrogen is the lightest and the first element of the periodic table. 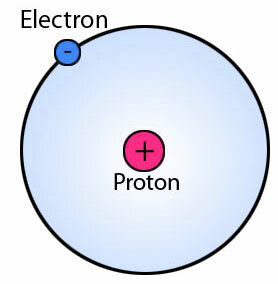 Its atomic structure is very simple, which is composed of only one proton, and one electron that orbits around the proton. Hydrogen is present in the body of every living thing, mostly in the form of water. Let’s discover more about this amazing element. Hydrogen is a colorless and odorless gas that is rarely available in the atmosphere. It is highly flammable gas. When hydrogen is burnt, it gives invisible flame which makes it a very dangerous gas. Hydrogen is found as a diatomic molecule H2 in its free state. NASA, use the hydrogen gas in its rockets as a fuel. When it reacts with oxygen, it produces the very high amount of energy that can lift the rocket. The rocket contains the supply of both liquid hydrogen and oxygen in its fuel tanks. It is used to make ammonia fertilizer for agriculture. It was once used in lighter-than-air balloons because it is the lightest gas that can lift more weight than any other gas. But due to its flammable nature, it no more used in the lighter-than-air balloons. Many high-temperature welding stations use hydrogen gas to weld a wide variety of metals. Hydrogen is the most abundant element in space. Hydrogen is the most abundant element in the universe. All the stars you see in the sky including our sun are made up of mostly hydrogen. They use hydrogen as a fuel in the fusion reaction to produce energy. The gas giants (e.g. Jupiter, Saturn, and Neptune) are also made of mostly hydrogen gas. It is also an abundant element here on the Earth. What! Then where I can get this? Actually, you can’t get the hydrogen in elemental form because it is not freely available on the Earth. It is available in the form of compounds like water, hydrocarbons, hydrides etc. Hydrogen gas is also available in the upper atmosphere but in small quantity because it is so light that it can reach there easily and escape into space. Hydrogen gas was recognized as an element by Henry Cavendish in 1766. He performed an experiment, in which he poured hydrochloric on the zinc metal and collected the gas produced in the reaction. He found that, when that gas was burnt in air, it produced water. Jupiter is considered to have a core made up of liquid metallic hydrogen. Metallic hydrogen is the hydrogen compressed and heated enough to behave as the liquid metal (like mercury in the thermometer). When acids react with a metal, they produce hydrogen gas. Abdul Wahab, "Hydrogen," in Science4Fun, April 13, 2019, http://science4fun.info/hydrogen/.